Can Kodak Democratize The Blockchain? The once-dominant camera company Kodak made two major product announcements at the CES (Consumer Electronics Show) this week that breathed some new life into a brand on its last legs. First, they are licensing their brand name for a KashMiner, a specialized computer that’s designed to harvest Bitcoins. Second, and more relevant to Artnome readers, Kodak is launching their own currency, the KodakCoin, in an attempt to improve image rights for photographers. Their stock, which has been cratering since they emerged from bankruptcy in 2013, rose from $3.10 to $10.70 within two days of these announcements. We at Artnome have been tracking the emergence of the blockchain art market and in particular its potential to improve artists’ image rights management. So when Kodak entered into the world of blockchain, cryptocurrency, and image rights management, I decided to learn more and share my thoughts. I was initially tempted to write a story about Kodak rising from the ashes like a phoenix - an Apple-like resurgence led by a return to the core principles of their brand. After all, Kodak is best known for taking the complex chemical process of early photography from the darkrooms into living rooms and the hands of the everyman. But then after researching a bit more, I decided Kodak may be more of a sacrificial lamb, or perhaps more accurately, they may just be William Devane. Companies have long known they can trot out old B-movie celebrities from retirement as a trusted friendly face to inform the older generation. Typically these commercials appear during daytime TV when older retired folks are the primary audience and airtime is cheap. They start by talking about the good old days, acknowledge the anxiety that comes with trying to keep up with a changing world, and then offer a solution in the form of a product or investment pitch. The Kodak brand has a chance to be the William Devane of the blockchain and cryptocurrency for the large, aging boomer population. Hell, they may as well borrow the script from the Rosland Capital video above, switch "gold" to "KodakCoin" and replace Devane with an animated roll of Kodak film. The irony here is that the promise of the blockchain is to lessen the dependence on a trusted third party. Historically, transactions were verified by a central authority or “middleman” like a bank, credit card company, government, etc. By combining the security of cryptography with the accessibility of the internet, blockchain offers a safe way to authenticate information and establish trust. Blockchain effectively cuts out the middleman by moving from a centralized to a decentralized authority obtaining verification through consensus, not through a trusted singular entity. Distributed ledger technology may be public, decentralized, and trustworthy, but for for the everyday person, the concepts are difficult and can be frustrating to try and understand. This is where a brand like Kodak, whom baby boomers grew up trusting for decades to capture their most intimate family moments, may help transition a large population of skeptics into users. 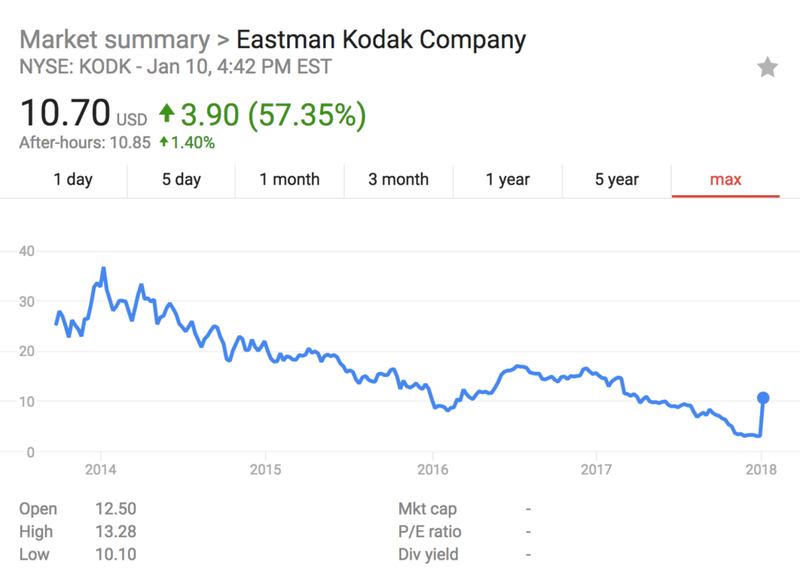 By getting boomers to try out and understand cryptocurrency and blockchain technology, Kodak could do for cryptocurrency what eBay did for PayPal. This mass adoption is an important step if cryptocurrency is to go mainstream, and in many ways a smart move by Kodak, whose waning brand is their greatest asset. So this means great things for Kodak, right? Well, probably not. Like Devane, Kodak's best years are likely behind them. I see no reason to believe that they are better positioned than other companies working on the same image rights problem. What's to stop a more mature solution like Ascribe from licensing "Polaroid," an equally popular brand that better resonates with hipsters and millennials? Despite a massive head start, Kodak lost the digital camera battle by over-focusing on printing and other physical components closer to the origins of their brand. They then went on to bankruptcy, and then ten plus years of steadily declining stock price. While the KodakCoin is actually a good idea, they paired the launch with the KashMiner, a device that looks like the ghost trap from Ghostbusters and is being heralded as a scam just days after launch. This may be a good time to revisit Ethereum founder Vitalik Buterin's caution that that we should expect nine out of ten coin offerings to fail, he went on to say, “There are some good ideas, there are a lot of very bad ideas, and there’s a lot of very, very bad ideas.” I tend to agree with him. For all the enthusiasm around blockchain, it is not a magic potion guaranteeing success to all who embrace it. My guess is Kodak will see some adoption from professional photographers closer to the retirement age. If they are able to get traction, a company like Google with years of experience on reverse-image search might snap them up. Not a bad outcome for a company whose primary asset is a historic and trusted brand.